Mont Ventoux (the windy one) is well known to anyone who's visited Provence; it's visible from just about everywhere, together with its sister, the Lure. It can't be ignored. It looms over you the entire time you are there, taunting you. It's a different colour from the rest of Provence, and seems to float above it; it looks less like a mountain than a captured asteroid. Definitely, it doesn't look like you can get to the top by bicycle. But if you are there on a bike, for any length of time, you will end up thinking this: I have to try. Mont Ventoux became a cycling mecca in the early 1950s, when it was first included in the Tour de France. It's been featured dozens of times since in the Tour and now, at most times of the year, has hundreds of cyclists converging on it on every fair day. 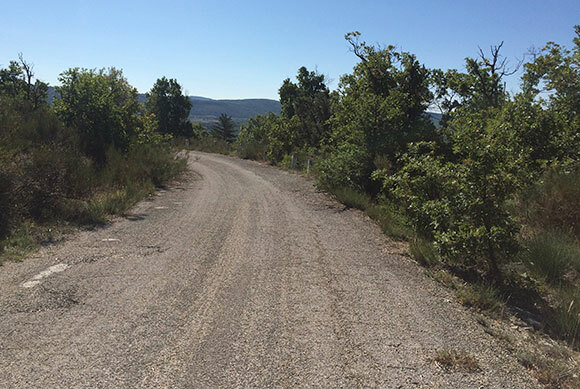 It's a classic French road climb, whether taken from Bédoin, Malaucene or Sault. All the routes run up through forests of larch and Atlas cedar to the famous, wind blasted, moon-like landscape at the top. Because the mountain is so much higher than anything near it, it's incredibly exposed, and some of the highest wind speeds ever recorded in Europe were measured here. The views from the summit are terrific - all the way from the Alps to the Med, and all the more striking because the mountain and the rest of this east-west massif are the dividing point between the wetter, lusher climate of midland France (think Lyon) and the mediterranean climate of the Riviera (think Marseilles). 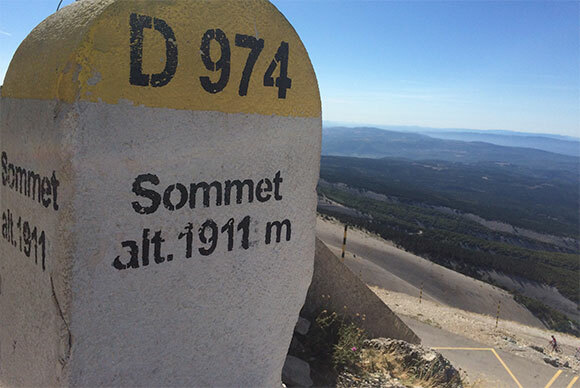 The contrast between the views of the rugged Drome region north of the mountain and the much smoother, drier, serene landscape of upper Provence is stark, and best seen from the summit of Mont Ventoux. Thanks to TV coverage of the Tour, the place was always going to be a magnet for road cyclists; but the day I went to the summit, there was every type of bike and just about every type of rider up there. Most of them as knackered as me, but I have to say, not all. It was also incredibly cold; that's pretty much all I can remember of the top. The mountain is much more than the three routes up by road, which all converge on a brutal, exposed, steep area near the top. The Bédoin and Sault routes merge at Chalet Reynard, and take the east face via a series of switchbacks to the summit; the Malaucene route follows the west ridge. The mountain as a piece of earth is huge, and basically has its own ecosystem, with almost unique landscapes, plants and animals found nowhere else, and an astonishing variety of trails and ancillary roads over and around it, especially on the south side. It's these I spent most time exploring, after discovering them by accident, based in the small village of Villes-sur-Auzon, waiting out a thunderstorm in a tiny tent. (Not recommended.) If you've got fat(-ter) tires, you can have an entire holiday, here on this one mountain. There are fantastic places to base yourself, V-s-A, Bédoin and Sault being my favourites. All have great little campsites (although the one in the centre of Bédoin is prone to theft). Get a trail map from any of the campsites or hotels and get into it. The main problem will be riding up into the mountains and back down every day, but that can make you very lithe in a very short space of time, and if that doesn't appeal, there are other options; pitch a tent behind a tree somewhere on the western slopes, or shack up somewhere further up the mountain, like the intoxicating villages of Monieux and Sault. 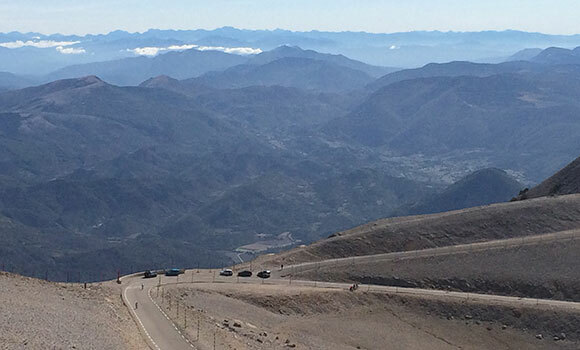 On the climb up Mont Ventoux from Sault (looking back southeast). This is just over half way up. 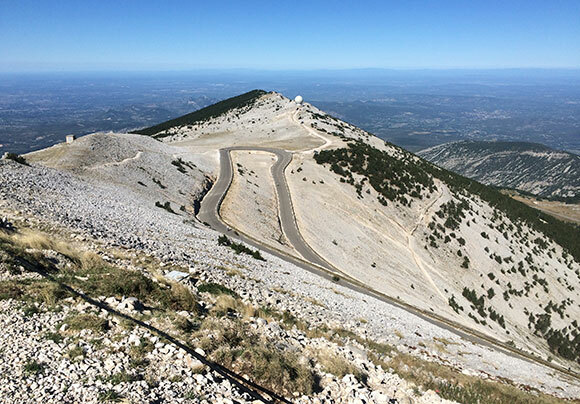 Sault is by far the best place from which to ride up to the summit of Mont Ventoux on tarmac - although it's much farther from here to the summit in terms of distance than from Bédoin or Malaucene, there's not quite as much height to climb and the average gradient is shallower. It's just as pretty, probably more so as far as Chalet Reynard - and from there you join the other road coming up from Bédoin. I won't bother describing the climb here, it's on plenty of other blogs and there are a ton of YouTubes on it. I started early because the bookshop owner told me it was less likely to be windy on top before 10am, but apart from that there's no particular reason to do it at any one time of day. It won't take all that long - I took less than three hours including a stop for a picnic breakfast about 1/3 way up - and you'll hurt, a lot, as you near the top. It's incredibly beautiful and months later you'll wake up dreaming about it. Well, I hope you do. The descent is amazing. It's about 26km, and ought to take about 30-40 minutes if you want to monster it. If you happen to do it on a fast mountain bike, as I did, you may end up passing many of the road bikes that probably passed you on the way up. They often come away suddenly from the apex of fast corners as they lose traction, or nerve, so give them a wide berth. It's worth remembering they have less rubber on the ground when fully upright than you do while leaning right over. Watch out for debris on the road as well - dry baked dirt, leaves and pine needles gave me a few frights. I saw a couple of really nasty cases of road rash back at Sault. And when you do get back to Sault, remember to hit the Glacier for a beer. The summit ridge of Mont Ventoux runs almost east-west, but the whole mountain makes more sense if you picture it as a north-south crescent with a steep concave side facing west across the flats of western Vaucluse - Carpentras, Orange and Avignon. Halfway down this crescent is Villes-sur-Auzon, a small, friendly but very untouristy village with an excellent campsite; starting there is the most beautiful ride I have ever done - the Nesque. The Nesque river gorge cuts through the foothills of Mont Ventoux spectacularly. Even more spectacular is the D942 road, cut high into the cliff on the north side of the gorge for most of the way. The road climbs steadily from V-s-A over 20km to Monieux, high above the gorge, with nothing on your right except free air and a humming sound which is probably the blood in your ears. Various short tunnels and overhangs just add to the joy of it. The views are stunning - ride it in this direction, west to east, to have the drop right beside you. I've ridden tens of thousands of kilometres, some of it through very beautiful country. Nothing has affected me so much as this 20km section of road through the Nesque. If based in V-S-A, a great loop is to ride the gorge to Monieux, continue to Sault, then head due south on the D943 for 9km (again, basically all uphill) until it joins the D5 coming up from Méthamis. This road runs down the other side of the Nesque from the one you cycled up, and although the gorge is out of sight of for most of the way, the ride is exhilarating. The point where you cross the watershed back over to the west side of the mountain, near Saint-Hubert, is unmistakable and the descent from here is full on until you reach Méthamis (but be sure not to accidentally take the D15 south just after Saint-Hubert; it's easy done). To actually get into Méthamis, you need to ride down a big hill to the river and back up the other side; don't bother as it's not that interesting and, probably, nothing will be open. Continue to the D14 turnoff and follow that back to V-s-A. One of the most satisfying spots on this Earth to sit and drink a post-ride beer is the appropriately-named Café du Soleil in V-s-A on the roundabout from which the D942 snakes southeast out of town to the Nesque. Most riders who tackle the Nesque ride both out and back on this road, so you can sit here and watch easily - easily - $250,000 worth of bicycle returning from the gorge in the time it takes to down a large one. They come screaming downhill and stop to refill either at the café or at the water fountain across the road. Even more satisfying, if you get back early enough, is watching the back shift head out in the baking afternoon sun while you casually attract the manager's attention and nod at your beer glass. The Nesque gorge looks from above like it would be a stunning place on a mountain bike, but the truth is it's incredibly rough in the gully itself, and although there is a broken hiking trail at various points, it's impassible by bike - you'd have trouble even carrying a bike in long stretches of it. However, the northern section due south of Monieux has a north-south trail visible on Google Maps which is rideable (and very pretty) through the Vallon de Peissonnier. Stay on the trail where it turns east past the farm, and don't be tempted by the goat track which sidehills down toward the river. It looks inviting, but that way lies madness, and, possibly, death. Monieux is a small village stuck onto the cliff on your left shortly after you exit the gorge, a place you can't really see from the road and which wasn't mentioned in any of the guidebooks or web pages I read before coming to Provence. It's incredibly pretty, with the most stunning restaurant I've ever seen right at the top of it. Warning: the cobbles in some of the streets going up the steep route into Monieux are incredibly slippy. Sault and the surrounding area are the capital of lavender-growing in Provence. The sensation of riding over the mountain roads with the scent of the stuff (August is best for this) rising from every field is something akin to wonder. In the village, they play it up; everywhere is called Lavende-something and everything, everything is painted purple. There are some good bars in Sault but for cyclists the only choice is the Glacier, with its views out over the farms and lavender fields to Mont Ventoux, and hundreds of road bikes leaned against each other outside. The campsite is up an insane hill at the back of the town, but it's a good site, friendly and secure despite its appearance, and there's a bike trail in and out of town. A vertical one. After leveling out the bike path passes a good bike shop off to the left by a roundabout. 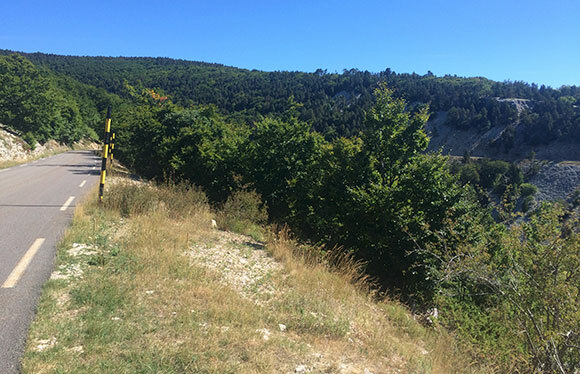 The Drome country immediately north of Mont Ventoux is very different from Provence, and very worth a visit. A good introduction is to ride from Sault to the imposing hillside town of Montbrun-les-Bains via Aurel. The countryside is beautiful, rugged and lush, much wetter than Provence and the hillsides are covered with logging tracks and minor roads ripe for exploration. The mapped route takes a lovely descent though the forest after riding through Aurel - a place I found altogether spooky - and returns via the D942, an incessant but very pretty climb into the back of a bowl-shaped gulch. The stretch of the D942 immediately south of Aurel is very pretty, with great views out to the west. Also worth a look is the Ancien Chemin d'Aurel - the old road - which runs roughly parallel. Very, very beautiful, little narrow road with hardly a soul about. Riding this area is the strangest sensation if you've been in Provence for a few days - there are no tourists in this part of the Drome, and hardly anyone about. The west face of Mont Ventoux is criss-crossed by excellent trails which are a mix of hardpack and stony trail. The main trails start from the Vallon des Paillasses near Bédoin, Les Constants and Les Baux. All of these will take you to the D974 road which runs over the Ventoux summit, either on a hairpin bend 1km west of the summit, or at Chalet Reynard. Numerous smaller trails also offer independent routes, but they look very steep and rough. 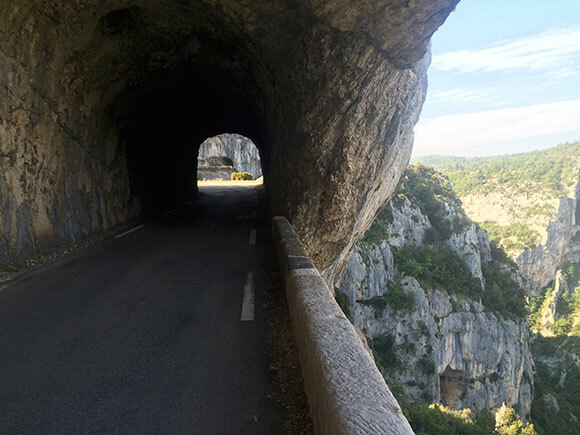 A fantastic ride over the massif is to start from Sault and ride to Flassan on the west side via the D1 and D217 minor roads; the route des memoirs, which most of the cyclists assembling for a blat at the top will never see, and which I can't recommend enough. It's a beautiful trip through mature cedar forest on the plateau, followed by a thrilling descent into the bizarre town of Flassan. The 217 is barely a road at all; just an old deteriorating surface with stunning views up and down the mountain. I passed one road cyclist and not a single car the entire way.